If you’re a commuter, you probably already know that more time on the road equates to more chances of car accidents. Even if your commute is only 20 or 30 minutes, you’re still running a higher risk of a car collision or other incident, especially if you are commuting during high traffic times in the morning or late afternoon. 1) If you can, change your hours at work. If your boss is open to it, why not come in an hour early/late and leave an hour early/late? While this might not eliminate the high traffic commuting altogether, coming in at 7 and leaving at 4 might at least reduce the number of cars on the road and therefore lessen your chance of an accident. 2) Don’t try to do work while driving. 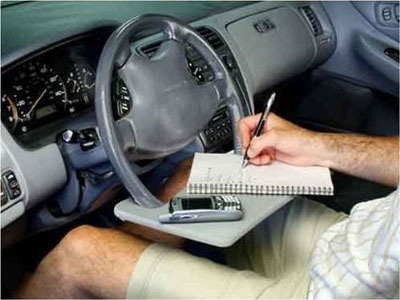 Many commuters try to multitask while they are driving, thinking it makes them more productive. Making phone calls, responding to emails, going over notes, or listening in on conference calls are all things that might make us feel like we are getting something accomplished on the way to work. However, the truth of the matter is, all you’re doing is creating a distracted driving environment and increasing your chance of an auto accident. It’s likely that you aren’t doing your best work anyway as most of you (hopefully) are focused on driving, so why not keep work for when you arrive at the office? If you feel you can’t accomplish everything you need to during the day, skip a lunch break, stay a little later or come in on a Saturday—just don’t try to play catch up while you’re on the road! 3) Consider carpooling. Riding with one or more other commuters reduces the number of cars on the road. It’s also a great idea if you tend to get sleepy on your morning drive – your carpooling compatriots can keep you awake and entertained! If you all work together, you can even use this time for brainstorming sessions or strategy (or even get your office gossip out of the way so you’re not wasting time at the office). 4) Keep your car in top shape. While you should always keep an eye on tire pressure and condition, oil changes, and other maintenance issues, this becomes even more important when you’re a commuter. A blown tire on the freeway is not only annoying and time-consuming, but it’s also very dangerous (especially during rush hour). Make sure you routinely take your car in for maintenance and keep an eye on those tires! 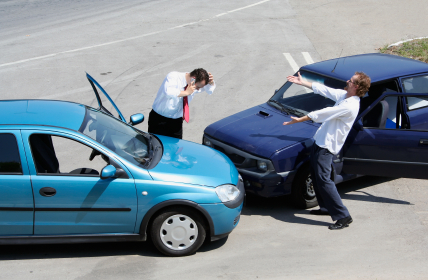 No matter how safe of a commuter you are, there is always a chance for auto accidents due to other drivers and unforeseen circumstances. Always keep the number of a tow truck, your insurance carrier, and a collision center you trust handy and make sure you have the tools and materials in your car to assist with a tire change or to keep you warm should you have car trouble in the winter months. Here’s to a safe and stress-free commute! Thanks! I needed this! I drive one car and take the husband to work, kids to different schools, and then myself to 2 different jobs. Then I go and pick everyone up! I am on the road a LOT. Any tips to help is a good thing!